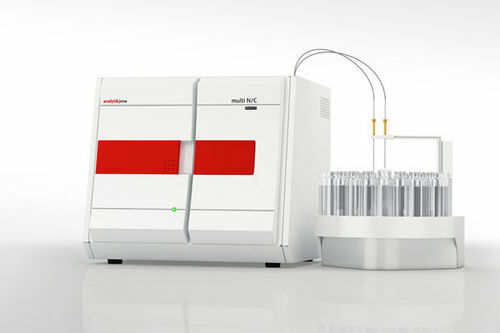 The Multi N/C® pharma is a total organic carbon (TOC) and total nitrogen (TN) analyzer engineered by Analytik Jena. It is suitable for use in pharmaceutical applications requiring special technological solutions, such as high sensitivity and precision, including flexibility to satisfy pharmaceutical industry requirements. The equipment comes in two versions. The Multi N/C® pharma HT is for catalytic high-temperature with a maximum combustion of 950°C, while the multi N/C® pharma UV offers wet chemical oxidation in a high-power UV reactor. The two versions focus on precision and accuracy of the measurement values in the lower range. The unit uses a volume-specific calibration method to perform reliable calibration down to the lower ppb range. It features minimal system blank values by the automatic purging of the used chemicals.